Tony and Tina meet Harry, the flying car. He takes them on a little adventure. They’ll never complain about having to take naps again! We join twins, Tony and Tina, who are playing in their bedroom. Whilst they are watching cars pass by on the street below, Harry the red flying car appears at their window. He asks Tony and Tina if they’d like to go for a ride. They jump in and begin their mini adventure. He takes them on a magical journey up into the clouds and through a rainbow. Soon, Tony and Tina’s mummy calls for them outside their bedroom door. They wake up and realise that they had been dreaming. Their mummy tells them it’s nap time. Tony and Tina don’t usually like naps. This time, they jump at the chance – so they can have another adventure with Harry! They’ll never make up excuses to avoid nap time again. This is a lovely engaging book with vibrant illustrations. The story is clever too. It will appeal to both boys and girls. It might encourage those children who dislike having naps, into taking them. The story is quite short and I felt it could have been a few pages longer. Harry could have taken them further than up in the sky and down a rainbow. I spotted the nod to the rainbow dream – there was a framed picture of a rainbow hung on the wall outside the bedroom. I also thought the bedroom was typical of a child’s room. There was an amusing addition of a sock and other clothing hanging out of the drawers! 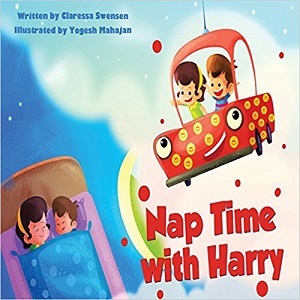 As a parent, I liked the clever pointer of Harry telling the twins to ‘buckle up’ when they got in the car, and also the promotion of good sleep practice. All in all, a great and happy bedtime read for young children.